In a small bowl, whisk together the fresh lime juice, soy sauce and sesame oil. Pour the mixture into a large resealable plastic bag. Add the ginger slices. Season the ahi tuna steaks with pepper, transfer to the bag and seal the bag and marinate for 15 minutes. Take care not to marinate for any longer, otherwise the fish will start to "cook" in the marinade. Transfer the marinade to a medium glass bowl and microwave for 1 minute. Heat a nonstick skillet, cast iron skillet or grill pan over medium-high heat. Sear the fish until the desired degree of doneness is reached, about 2 minutes per side. 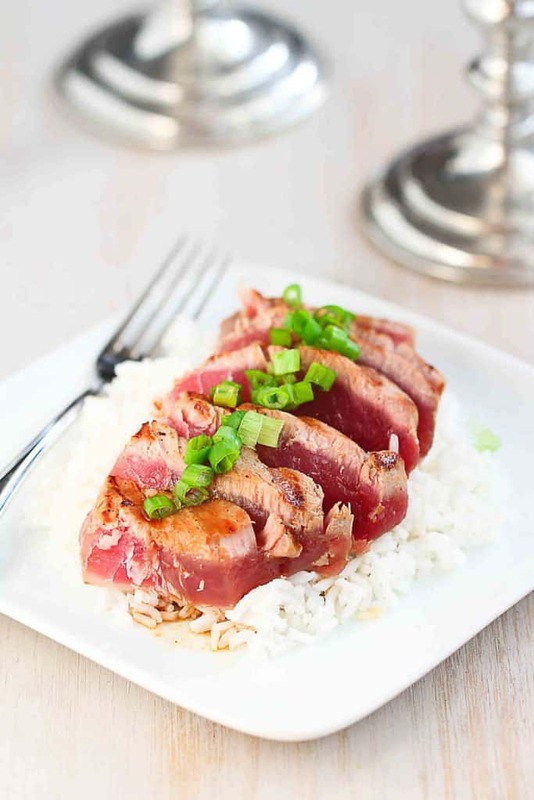 Thinly slice the ahi. Garnish with green onions and serve with the heated marinade.